The Jewel Cichlid originated from the rivers in Africa in the Zaire region. It is one of the most aggressive tropical fish and is not suited for a community tank. The Jewel Cichlid is also known as the Jewelfish and the Two Spotted Jewel Fish. The scientific name Hemichromis bimaculatus refers to the two large spots along its body. Hybrid varieties may not show these spots. 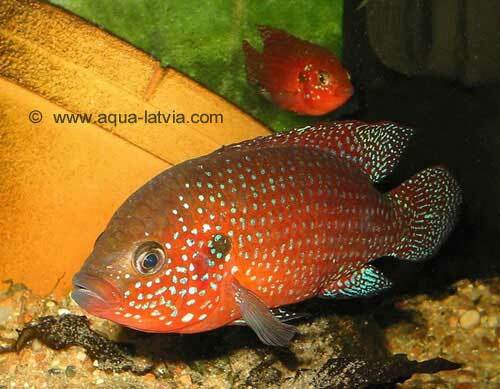 The basic coloration is yellow/olive, but colors become intense red with iridescent blue/green spots during breeding. A common hybrid is the Blue or Turquoise Jewel. There is also a red forest variety known by the scientific name Hemchromis lifalili. The Jewel Cichlid digs for food in sandy and muddy substrate. It will destroy most plants, so don’t hope that any of your beautiful plants will survive. Jewel Cichlids eat flake foods, algae flakes and pellets. The tank should have caves. The Jewel Cichlid is compatible with less aggressive Mbunas and similar sized Peacock and Haplochromis African Cichlids. Jewel Cichlids are known to kill Plecos and New World Cichlids, such as Jack Dempseys and Green Terrors. The Jewel Cichlid is not difficult to breed, however obtaining a pair can be a challenge. One method of obtaining pairs is to keep a group of juveniles together and watch for pairings. When they reach adulthood, you can’t reasonably keep more than one pair of Jewel Cichlids in a tank though. At breeding time, both sexes become more colorful, with the male taking on a brilliant red. Care should be taken to watch the pair closely, as the male Jewel Cichlid may kill a female who is not ready to breed. Providing hiding places can help. Both parents will work to clean a surface for the eggs, preferably a flat rock with a 45 degree angle from the substrate. If they can’t find a surface, they may use aquarium glass or make a shallow dugout area on the bottom. Parent should be left in the tank after spawning, as Jewels are great parents. They will remove (by eating) any eggs that aren’t fertilized. The fry will hatch in one to two days and can be fed brine shrimp when the yolk sac is depleted.